Dog skin irritation, itching and the scratching and any secondary complications (caused by the itch or skin condition) may occur in number of Integumentary (skin related) conditions. Severe or chronic and untreated cases of such conditions may exhibit more severe symptoms, such as severe alopecia (hair loss) and any discomfort a skin irritated dog may experience. 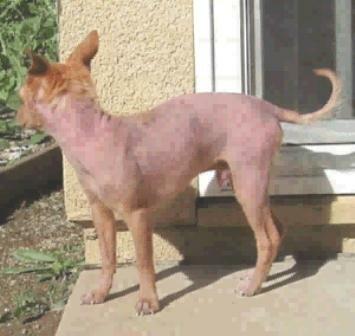 Mange: is one of the major causes of canine skin irritation. When a mite burrows into a dog's skin, it may lead to various conditions such as red mange and walking dandruff. Dogs may experience severe itching and irritation. In many cases scratching & rubbing may cause self injury, which complicates the condition and sometimes triggers severe secondary complications such as the involvement of deep tissues and a generalized illness (illness that affects the entire body). Allergy and Canine Skin: A number of factors like pollens, pollution, nutritional components, drugs, wasp bites and many others may act as irritants for dogs & acts as a cause of skin irritation. Canine atopy (sensitivity to an allergen) such as an allergy caused by pollen, is more common in the summer and fall. Similarly nutritional supplements containing large quantities of minerals, mostly zinc may act as an allergen in some breeds of dogs, which causes itching and irritation of the skin. Yeast Infestation: Yeasts may cause itching and irritation as do many other fungal species. 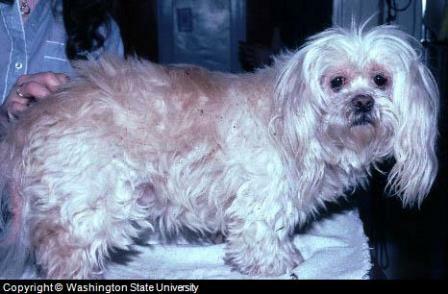 Aspergillus and the malessezzia species are some examples which may cause skin irritation in dogs. Such irritation is more common in those dogs residing in damp and dark environments. Infectious Dermatitis: Several bacteria and viruses may cause dermal inflammation, which may result in to severe irritation and itching. Dogs may exhibit signs of itching and skin irritation in canine distemper, especially in young dogs. Similarly, once a secondary bacterial or viral infection is triggered in the skin, signs of skin irritation and itching become more frequent. Misc. Factors: Other than above mentioned factors lice, fleas, ticks, hormonal disturbances like that of hypothyroidism and different types of housing cause dog skin irritation. Dog skin irritation is sometimes a primary sign or it occurs as a result of other symptoms. Dogs with hair loss and hair keratinized sensitivity problems experience skin irritation due to follicular (hair) stimulation at the hair base. Keratin is a protein that is present in hair and at the hair base. If the amount of keratin increases, it causes a dog skin problem called keratinisation, in which the surface of the skin and the base of the hair gets hardened. Hardened skin stimulates nerve endings in the skin, which in turn causes skin irritation. Follicular stimulation at the hair base also causes canine skin irritation. Follicular stimulation is actually stimulation of the nerves that exist at the base of the hair. It may be due to hair loss (alopecia). If hair is removed from its base or if there is keratinisation on the skin surface it can cause follicular or nerve stimulation. Similarly, dogs that have oily skin and/or seborrhea (excess oil) can exhibit signs of itching and irritation due to the accumulation of dust such as pollen or hair dust which mixes with skin oil. This can stimulate the ends of the hair follicles and cause tension/issues in the epidermis (outer layer) of the skin. Cells can also contract and become inflamed near wounds or at the edges of a rash. Irritation can also appear if a dog frequently rugs against hard objects and any resulting scratching of effected areas. Treating dogs with skin irritation and itching may require thorough observation for a causative agent and the degree of irritation. Removing the cause of the irritation should be the primary approach taken. Administrating a selection of drugs selected based on the diagnosed condition, either topically or orally may help. Anti fungal drugs, lime sulfur dips, and corticosteroids may help in not only eliminating the different causes of localized irritation but also reduce the chance of various symptoms, like irritation. The localized application of several flea, fly, mite, lice and tick repellents is helpful. Shampooing dogs with quality products on regular basis may help in reducing irritation such as the homeopathic PetAlive dog care shampoo . Medicated, degreasing, antiseptic, anti–lice and anti–dandruff shampoos are very helpful in reducing irritation, as per cause of irritation. Clipping hairs in many dogs can also be very helpful in reducing dog skin irritation. Hair sometimes causes severe irritation in dogs with sensitized skin.